IngBratislava — king kayang amlat Pozsony ampong Pressburg (lawen ya rin aliwang lagiu) — iay ing tugnku ning Slovak Republic ampong, atin yang populasiun a 429,000, at iti mu rin ing pekamaragul a lakanbalen ning bangsa. Ing Bratislava atiu king maukingalbugan ning Slovakia keng pampang da reng Ilug Danube. kasepu ne ing Austria ampong Hungary, at iti mu kabud ing tungku (kabisera) a atin sepu aduand bangsa. Iti at ing Vienna ila mu rin deng aduang pekamalapit a tungku king Europa a kulan keng 60 kilometres () karelang pamikawani. * Numbers in brackets list the year of twinning. The first agreement was signed with the city of Perugia, Umbria in Italy on July 18, 1962. ↑ Population on December 31, 2006 - districts. Statistical Office of the Slovak Republic (2007-07-23). Retrieved on January 8, 2007. ↑ Dominic Swire (2006). Bratislava Blast. Finance New Europe. Retrieved on May 8 2007. ↑ Urban Bratislava. Statistical Office of the Slovak Republic (December 31, 2005). Retrieved on April 25 2007. ↑ Population and Housing Census 2001. Statistical Office of the Slovak Republic (2001). Retrieved on April 25 2007. 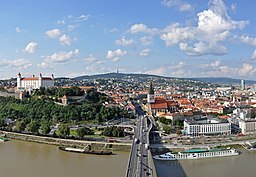 ↑ Bratislava City - Twin Towns. © 2003-2008 Bratislava-City.sk. Retrieved on 2008-10-26. Horváth, V., Lehotská, D., Pleva, J. (eds.) et al. (1979). Dejiny Bratislavy (History of Bratislava), 2nd (in Slovak), Bratislava, Slovakia: Obzor. Janota, Igor (2006). Bratislavské rarity (Rarities of Bratislava), 1st (in Slovak), Bratislava, Slovakia: Vydavateľstvo PT. ISBN 80-89218-19-9. Kováč, Dušan (2006). Bratislava 1939–1945 – Mier a vojna v meste (Bratislava 1939–1945 – Peace and war in the town), 1st (in Slovak), Bratislava, Slovakia: Vydavateľstvo PT. ISBN 80-89218-29-6. Kováč, Dušan et al. (1998). Kronika Slovenska 1 (Chronicle of Slovakia 1), 1st, Chronicle of Slovakia (in Slovak), Bratislava, Slovakia: Fortuna Print. ISBN 80-71531-74-X. Kováč, Dušan et al. (1999). Kronika Slovenska 2 (Chronicle of Slovakia 2), 1st, Chronicle of Slovakia (in Slovak), Bratislava, Slovakia: Fortuna Print. ISBN 80-88980-08-9. Lacika, Ján (2000). Bratislava, 1st, Visiting Slovakia, Bratislava, Slovakia: DAJAMA. ISBN 80-88975-16-6. Špiesz, Anton (2001). Bratislava v stredoveku (Bratislava in the Middle Ages), 1st (in Slovak), Bratislava, Slovakia: Perfekt. ISBN 80-8046-145-7. Varga, Erzsébet (1995). Pozsony, 1st (in Hungarian), Pozsony: Madách-Posonium. ISBN 80-7089-245-5. Jankovics, Marcell (2000). Húsz esztendő Pozsonyban (Twenty years in Bratislava), 2nd ed. (in Hungarian), Pozsony: Méry Ratio. ISBN 80-88837-34-0. Tauli yang miyalilan ining bulung anyang 12:01, 13 Juniu 2018.